Conserve water and save money by watering your plants directly with drip irrigation. 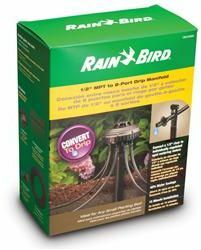 This kit contains everything you need to convert a 1/2" riser to eight individually regulated spot watering stakes that water flower beds, shrubs and more with pinpoint efficiency. Stop wasteful overspray and enjoy healthier plants while using less water.